Jebat Must Die really should blog more often. Known for his painstaking research and sharp perspectives, this anonymous blogger has made it his mission to expose the half-truths plaguing the more serious parts of Malaysia's blogsphere, where politicians and their machais lurk and conspire to fool some of us and, sometimes, all of us. Note to readers: Please leave comments at JMD's H E R E.
Janji Kroni Cina Kaya Ditepati!!! PM should award LCW a RM500,000,000 or RM250,000,000 MRT sub-contract job in recognition of his tremendous contribution to Badminton Malaysia! Patutlah beriya-riya benar si Rafizi making expose..kononya lah..rupanya kroni tak dapat..ingatkan niat ikhlas la nak bongkar salah laku, tapi ada udang di sebalik mee. Kita yang duk baca ni percayalah bulat-bulat 'pembongkaran' salah guna kuasa..
Lepas ni apa-apa expose dari PKR kena siasat dulu siapa yang ada kepentingan di sebalik tabir. Kudooos tu Jebat Must Die. p/s I have boookmarked your blog. ingress belongs to ramli formally a lecturer at utm. ingress in an engineering company that used to supply the parts for proton. then ramli merajok sebab the contract is not big enough. ramli set up his operation in southen thailand. he has always been the financier of pas. this kelantanes fellow has long been the supporter of nik aziz. 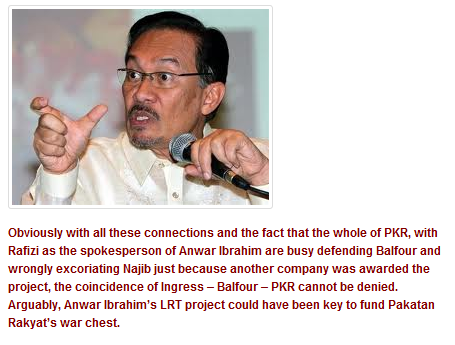 when anwar put kamarudin jafar to join and finance pas with money stolen from all the contracts that anwar gave when he was deputy PM, nik aziz and anwar naturally share many plan. anwar through kamarudin jafar, finance all the expanditure of pondok nik aziz. nik aziz was nearly bankrupt by the expanditure of the pondok at pasir tumbuh. so far nik aziz anwar is an angle.